During the simulation phase of radiation treatment, CT imaging is used along with aids such as skin tattoos, photographs and immobilization devices. During the initial simulation process, you can expect your appointment to take approximately an hour and a half. 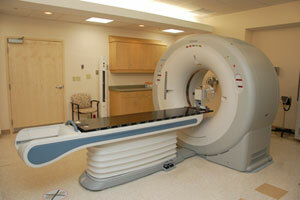 You will meet with the radiation therapists who work closely with the radiation oncologist. Using CT imaging, along with aids such as skin tattoos, photographs and immobilization devices, our team of professionals will gather all the necessary information to ensure that your position is reproducible for treatments on a daily basis. Once all the treatment information has been obtained, the radiation oncology nurse will discuss care related to your upcoming radiation treatments, let you know about supportive services available at CVMC, and answer any additional questions or concerns that you and/or your family may have. Patients are imaged on a CT scanner specially configured to acquire three dimensional images used for treatment planning. The CT scanner allows the radiation oncologist to localize the tumor and surrounding areas that will require radiation treatments. Our Toshiba Large Bore Acquilion CT Simulator is the largest bore of its kind in Vermont. This increases patient comfort and allows for more diversity in positioning patients for their radiation treatments. Once the patient’s position is determined, tattoo ink dots (the size of a freckle) may be applied to the patient’s skin to identify the area for treatment. Photographs of the treatment area are also taken to further document positioning so that the radiation therapist can accurately reproduce the position throughout the course of treatment. During the simulation process, immobilization devices may be produced to stabalize specific anatomical body parts and reduce patient movement during treatment. It is critical that patients remain in the same position throughout the entire treatment in order to enure accurracy and minimize the amount of healthy tissue within the radiation beam path. Examples of immobilization devices include breast-boards, head-frames, vacuum bags for thoracic/pelvic support, and face masks. If you are receiving radiation to your brain, head or neck, a mask may be made from firm plastic that is molded to fit each patient's face. Other types of cushioning devices may also be used for stability and comfort. Liquid styrofoam that expands and conforms to the contours of the body before hardening is typically used for immobilization of chest, abdomen and pelvic areas. Other devices, such as arm rests, may be used as well. Hip and pelvic devices may be made of liquid styrofoam or specially made cushions that cushion contributes to better stability and reproducibility. These soft cushions also promote patient comfort.